SAITAMA, Japan (The Japan News) ― A male guide dog was stabbed in Saitama in late July while assisting a 61-year-old man commuting to his office in Kawaguchi, Saitama Prefecture, it has been learned. The dog is believed to have endured the pain of the attack without making a sound, as guide dogs are trained not to bark except in such cases as their owners being in danger. The man, who is completely blind, reported the offense to Bunan Police Station. The prefectural police are investigating the incident as a case of property destruction, which involves heavier penalties than violation of the Animal Protection Law. According to police and other sources, the man left his home at about 11 a.m. on July 28 with his 8-year-old guide dog and took a train from JR Urawa Station to Higashi-Kawaguchi Station. 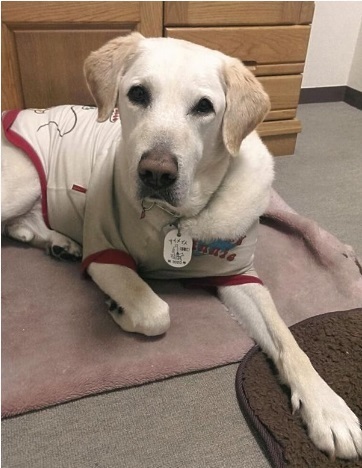 When he arrived at his workplace at 12:10 p.m., a colleague noticed that the dog, a Labrador retriever named Oscar, was bleeding from its midsection. Oscar had several stab wounds 1 to 2 centimeters deep at about 5-millimeter intervals. Although he appeared to have been stabbed with a sharp tool, no holes were found in his jacket, indicating that the perpetrator may have lifted the dog’s jacket before stabbing him, according to the sources. The police are conducting interviews and analyzing images from security cameras to confirm where the incident occurred. “I feel guilty that I didn’t notice he had been stabbed. Oscar was right beside me as if nothing had happened. That makes me (feel) even more sorry for him,” the dog’s owner said. “I want to ask (the perpetrator) if they could do the same thing to a family member. I can never forgive them, so I reported the attack to the police,” he added. Partly in consideration of the victim’s feelings, Bunan Police Station decided to press criminal charges for alleged property destruction, which would bring more severe penalties than violation of the Animal Protection Law. “Guide dogs are the hands and feet of visually impaired people, allowing them to live in society. This is tantamount to stabbing a visually impaired person himself,” said Noritoshi Sato, 43, deputy director of the Tokyo-based animal protection group Animal Green Apple. Oscar was trained by Takao Shioya, the head of Eye Mate Inc. in Nerima Ward, Tokyo. After the incident, Shioya said, “This is a despicable attack I can never forgive. Acts like this, which prevent visually impaired people from being part of society, must not be repeated.” He also said that many supporters of the organization had expressed distress over the incident.